Take a trip into an enchanted garden with with Secret Garden Crocheted Afghan. Embellished with beautiful flowers, this lovely afghan pattern is the perfect way to get your home ready for spring and summer. The lovely posies that cover this blanket give it a nice texture and make it stand out in any room in your home. 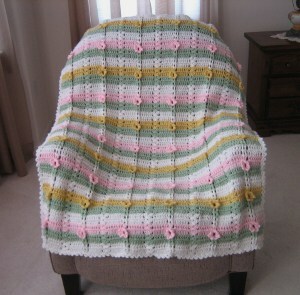 This lovely floral afghan would also make wonderful gift for a new baby. No matter how you use it, this lovely Secret Garden Afghan is like a little oasis right in the comfort of your own home. Shell – (2 dcs, ch 1, 2 dcs) in stitch or space as indicated. Picot – (sc, ch 3, sc) in stitch or space as indicated. Blanket is crocheted in multiples of 21 plus 20. Row 1 (RS): With white ch 125, dc in 4th ch from hook, 1 dc in each of next 5 chs, *ch 1, skip 1 ch, 1 dc in each of next 2 chs, ch 1, skip 1 ch, 1 dc in each of next 6 chs, skip 2 chs, Shell in next ch, skip 2 chs, 1 dc in each of next 6 chs, repeat from * across ending 1 dc in each of last 7 chs, turn. Row 2: Ch 3, * 1 dc in each of next 6 dcs, ch 1, bpdc around each of next 2 dcs, ch 1, 1 dc in each of next 6 dcs, Shell in Shell, repeat from * across ending 1 dc in each of last 7 dcs, fasten off and turn. Row 3: Join honeydew in first stitch, ch 3, *1 dc in each of next 6 dcs, ch 1, fpdc around each of next 2 dcs, ch 1, 1 dc in each of next 6 dcs, Shell in Shell, repeat from * across ending 1 dc in each of last 7 dcs, turn. Row 6: Ch 3, *1 dc in each of next 6 dcs, ch 1, 2 dcs in center of flower, ch 1, 1 dc in each of next 6 dcs, Shell in Shell, repeat from * across ending 1 dc in each of last 7 dcs, fasten off and turn. Color Scheme: Continue pattern for a total of 62 rows as follows: (2 rows each white, honeydew, lily pink, white, honeydew, cornmeal) 5 times, 2 rows white After last row, turn and do not fasten off. Work along top edge picot in right corner dc, *(skip 1 dc, picot in next dc) 3 times, skip ch 1 and 1 dc, picot in next dc, skip ch 1, picot in next dc, (skip 1 dc, picot in next dc) 3 times, picot in ch 1 space of Shell, skip 1 dc of Shell, picot in next dc, repeat from * across ending picot in last corner dc. Work along side edge picot in each dc across. Work along bottom edge picot in first corner ch, continue pattern of top edge ending picot in last ch. Work along side edge picot in each dc across, join to beginning sc and fasten off. I am so sick of winter, maybe breaking out my spring color yarn and working on this pretty flower garden afghan, will help me get my house ready for spring. I love the look of the little flowers on this afghan. 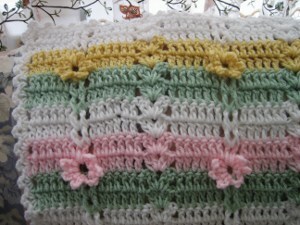 I am sure while I crochet it I will be thinking of spring and maybe even ignore the snow on the ground outside.